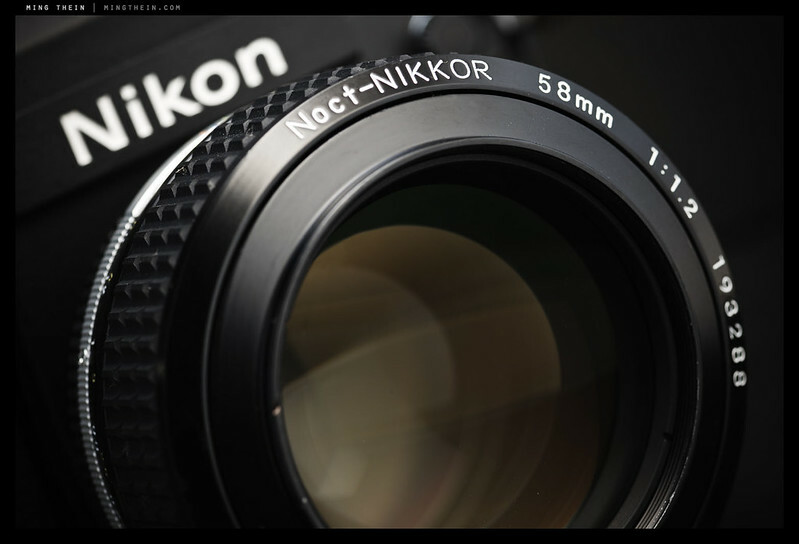 The Noct-Nikkor is perhaps one of the most legendary – if not the most legendary – of the lenses in the Nikon pantheon. Hitting the market in its first AI version in 1977, it was designed to do two things: firstly, be shot wide open, and secondly, push the limits of the F mount’s relatively narrow diameter with a lens that would collect enough light to shoot relatively slow film at night, and without a tripod. Although based on a traditional double-gauss design, the lens incorporated one enormous technological advance for the time. That advance was the replacement of the front element with an aspherical design to combat the effects of sagittal coma; in plain terms, this is the tendency for point light sources to ‘smear out’ at large apertures, especially towards the edges of the frame. The aspherical element is both a bit larger than it needs to be – so the edges of the lens aren’t used – and more critically, was polished by hand. I believe this is due to the tolerances required for production of the element; it’s certainly not possible to see that irregular curvature from the block diagram alone. When they were still available new, the price of the Noct was three times higher than the 50/1.2 – almost entirely due to the cost of producing that single element. Today, the 50/1.2 is still available new for about $700 from B&H, which would have made the Noct about $2100 in inflation-corrected terms. However, the reality is that since so few were produced – about 2,000 of the AI version, and 9,000 or so of the AI-S version, made up to 1997 – they tend to command healthy premiums today; lenses transact in the $3500-$4500 range depending on condition. Although buying one was fulfilment of a minor dream for me, it still makes me nervous every time I take it out. By any measure, that seems like a lot of money to pay for another half a stop of light-gathering ability and a very strange 58mm focal length; the question as always is, is it worth it? I actually find this very difficult to answer objectively. Any Nikon afficionado worth their salt will tell you they have a special place for the Noct because of what it is, similar to the Leica Noctiluxes; however, I’ve found that unlike the Leica Noctiluxes, they don’t seem to be quite as limited in their shooting envelope. Firstly, the Noctiluxes are significantly larger and heavier, and have a reduced near focus limit of 1m vs 0.7m for the f1.4 Summiluxes; there’s also a much longer and slower focusing throw, and the odd ‘swirly bokeh’ that people either tend to love or hate. I prefer to think of the 58 Noct as a fast 50 or fast 55 or steroids; granted, the regular SLR normal lenses never seemed to be quite as good as their rangefinder counterparts (something I’ve never been able to figure out) but there was a definite, tangible increase in optical quality as you moved up the range. Whilst the f1.8s might be excellent by f2.8 or f4, the f1.4s were excellent at f2, and so on. (The exception to that is the new f1.8G, which has aspherical elements and is excellent from f1.8, even on the demanding D800E, but I digress.) In the past, I owned both the 50/1.2 and the 55/1.2; I paired these lenses together with a D2H in a quest to find more speed and to counter the limited low-light abilities of that camera. The 50/1.2 was a bit better than the 55/1.2, being an newer design, but both couldn’t really be called critically sharp wide open – and that was on a camera with nearly 9-micron pixels! It was clear to see that the 55/1.2 suffered from internal flare and coma quite badly when used at f1.2; it was as though a soft portrait filter was being applied to the image. It wasn’t a bad thing for high contrast situations and portrait work, especially with the limitations of earlier digital sensors, but it certainly lacked bite until f2.8-4. Call it ‘character’, I suppose. What the 58 Noct does do is bring the high quality ‘usable’ shooting envelope closer to the maximum aperture; there are traces of reduced microcontrast wide open at f1.2, but by f1.4, things are razor-sharp across most of the frame, and f2 is excellent – even on the D800E, which surprised me. On 35mm film, the lens is very good even wide open, but oddly displays some mild focus shift wide open which I don’t see on the D800E. Coma is of course very well controlled well into the corners, as we would expect from that front element. There’s a bit of CA until you stop down, but at f4 it’s all gone, and the lens is resolving far, far more than even Acros 100 is capable of, and matching the D800E. Needless to say, bokeh is excellent at every aperture – as we would expect from a lens with a nice round 9-bladed diaphragm (earlier versions had 7 blades). The best place to find vintage gear is on the secondary market in Japan – send an email to Bellamy Hunt of Japan Camera Hunter; he can source to spec and budget. I get a good chunk of my stuff from him and can’t recommend him highly enough. Send him an email and tell him Ming sent you! Oh man, I hate that swirly bokeh. But it’s a cool, though something I never especially craved for; very expensive, only makes sense on the largest apertures and one has to like the character. But it’s cool in its own special way and I like your pictures here (note: 26 C isn’t too hot for development per se, but you may have overdeveloped — the negs should look quite dense if that happens..reticulation is another matter). Me, I have (among many lenses..) a 50/1.2, which has its own, soft character at max aperture. I don’t use it often, but I’ve made some successful portraits with it. Very hard to focus not only due to the abysmal screen, but also because it’s hard to make out the focal plane — no Zeiss snap there. I was under the impression that the only way to make an aspheric element of that size in the late 70s was through hand polishing, so the choice was more along the lines of making the lens a premium model or not. On the bright side, if kept properly the lens will last really long, something that always worries with modern, more electronic models…that’s one thing that makes me prefer mechanical models. If it’s a little bit swirly I’m fine with it; too swirly is simply distracting. Fortunately it’s never too swirly on the Noct, and stopping down a little makes it go away. My neg density is fine; I’m now starting to wonder if it’s flickr’s downsizing algorithm (which includes sharpening) playing havoc with things again. Totally agree on the preference for mechanical lenses; once the boards or ICs go inside our modern glass, kiss it goodbye. My 100% mechanical Zeiss ‘blad lenses – with leaf shutters – are 25 years old at youngest and still going strong. As for the Noct, I believe the element was hand polished – but the actual labor was done with a machine and guided by man. The different samples I’ve tried certainly have slightly different variations of character. I’m always wary about automatic downsizing combined with sharpening; those things don’t mix well with grain. Different variations of character sounds like collector territory to me! I notice those things, but am trying to focus less on such things since I already have more gear than I really need. FYI, sagittal is misspelled in paragraph 2. The word comes from sagitta, the Latin for arrow, a word also contributing to the name Sagittarius (Archer) in astronomy. Hi Ming, glad youre making progress with your “scanner”, can I just ask, will it be single shot, one frame or would we be able to stitch with it. Sorry to be off topic, yet again, everyone; but I thought on the article about Nocts, this might interest. The f/0.7 lenses Kubrik used, in action. Just watch one of the video samples. Amazing. Ming, you are really stoking my desire to return to b&w film, but what is holding me back is figuring out my process, particularly the scanning. When will your solution be ready? Also I will need some suggestions for macro lenses that will work well with your contraption. I am trying to stick with mirrorless cameras. I have a NEX-7 at the moment, but I’ve been thinking of switching to an EP-5 (for street use) Can you tell me your opinion about the relative suitability of each for the purpose? Would the Oly 60mm macro be a good choice, or do you think I’m better off with the some other combo on the NEX? Any 50-100mm equivalent that delivers 1:1 reproduction will work fine for 135 format, and 50-60mm for 120 645, 6×6 and 6×7. The Olympus 60 might be a bit long; I’d look at the Panasonic 45 or a used Nikon 55/2.8 AI Macro with an adaptor. The Micro Nikkor Ming suggests seems to be the hot option for scanning film with a camera right now, and they’re not very expensive. I think any decent big-brand macro 50 is going to be OK and cheap. I’ve been digitizing and stitching my MF negatives with a Sony NEX-5N and a Canon FD 50/3.5 macro I got from KEH for a song. I picked it because I already had an FD adapter and an extension tube, but if starting from scratch, I might have gone for the Nikon instead. 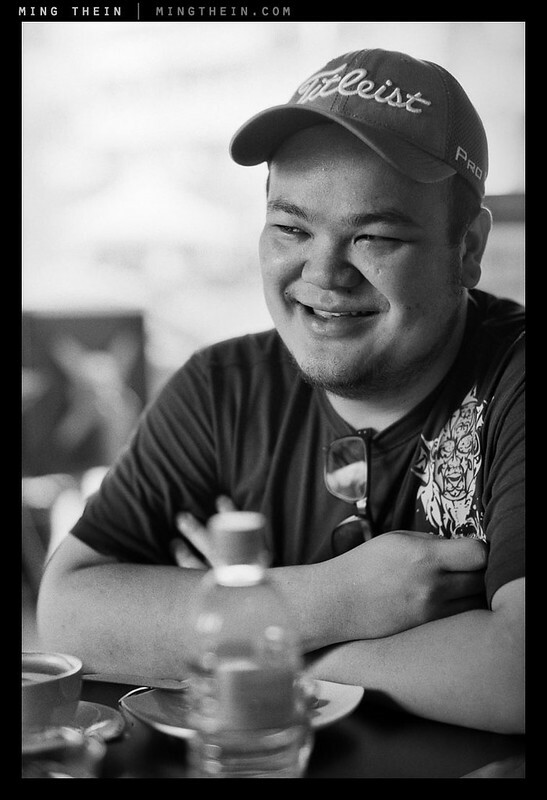 Some people use enlarger lenses, and I’ve seen good results from a normal 50 reversed, too. I’d keep the NEX-7 if I were you: the resolution is great for digitizing, and if it handles better than my 5N, I don’t see a problem with it for street photography, which is OK on my 5N. Have you tried the Sony/Zeiss 24/1.8 on it? It’s a really nice lens that handles really nicely for stuff like street. Thanks. I sold my CZ 24mm among other things to finance an RX1. I have some some Contax G lenses and extension tubes. I have a 100mm Makro-Planar but that is probably too long, and it is 1:2. I should see what I can do with those, just to get an idea of how much of the frame I can fill on the NEX. Thank you again for lovely images and interesting discussion. Interesting. It just looked like garden variety Flickr over-sharpening artefacts to me, and I didn’t think any more about it. So there’s two new concepts for today: reticulation and elevated temperature development. I’d still rather have the Noct. It might well be a combination of both actually, I forgot about the annoying Flickr habit. I was struggling to control the grain at first then figured out it was due to a combination of excessive agitation and short developing times due to high ambient temperatures; semi-stand development (one swirl every 30 seconds) and halving the developer concentration seem to have taken care of that. But, oh yes, you know it: Noct’s are investment grade assets. I think this must be a bit of a headache for you in a way. It’d definitely give me pause—I think the classic car owners on here wound probably have some wise words on the use/preserve front. What’s your take MT? A waste to use it? A waste not to use it? Used cars here are artificially inflated simply because new cars are subject to that ridiculous tax to protect our mediocre local car company, remember? Malaysia is a very bad example of a deregulated auto market. My other half discovered that in the US – came away with something Prada for about two thirds of what she’d have paid in KL. Tokyo is good for used bags, which look new, but have just been preowned and admired a couple of times. As for me – I already have a shopping list; F6 type K focusing screen, perhaps a titanium or regular F5, and lots of 120 film and developing. Especially E6. God, I’ve been looking and looking for a focusing screen for my F2—the F6 might be much easier, but I think your man Bellamy might be necessary to speed matters along. As far as the F2 screens go: you see the ones that no-one wants, like the type E and C, a bit; but the best one, the K? Tough cookie. Don’t know if the F6 K is the same as the F2 K, I doubt it since the F6 is still in production… assuming they aren’t the same, a trip to a big stockist, or even the Nikon Salon, should sort that one [the F6 K screen]. I saw a greyed out F5 last week. Said “50 year anniversary edition” or something on it. I don’t think it was the Titanium; the price was 45,000 JPY, or so, at any rate. Bog standard F5s in good working order and decent appearance, I see the them a bit: bottom end is 26/27,000 JPY, up to 50,000 as the looks and condition get better and better. I wouldn’t hand over more than 32,000 or so. They’re not the same. The F/F2/F3 screens all have a condenser lens in front of the screen – it’s a pretty thick assembly – the F4/5/6 use fiber optic bundles instead and forgo the condenser. I know the bigger Bic and Yodobashi stores in Shinjuku still stock F6 bits; you’ll probably have to try Map or Lemon for the F2. Last time I was there they had a decent selection. The 50th anniversary grey-top plate F5 with the old script on the prism head is the titanium edition. If it is what it is, and it’s 45,000JPY and in EX+/ near mint condition, I’ll wire you the money to buy it for me and hold it until November. You can even shoot with it in the meantime if you like. Don’t worry Ming, I’m round the corner from where I saw it—I’ll get there, check on it and get back to you. Save for the higher margin Rangefinders and lenses, Map have just given up on film cameras it seems. The old film SLR floor is slowly getting taken over by mirrorless and other bits and bobs. You definitely get the impression they are consciously weighting the business toward all digital now. When I first went to Map, it felt like some well kept secret; but now I realize that is part of the schtick—it’s for people who aren’t satisfied by Bic, Yodobashi, but are too intimidated by the grumpy old man stores where real gems can be found [at the expense of horrid service and mountains of bric-a-brac]. I had a go on the Shinjuku branch of Lemon and didn’t think it had much to offer me; I’ll try again. But it did feel like a take off of Map. I think I’m really getting into the grouchy grandad shops. I bet vinyl collectors all over can relate! Surprising news on Map. They do have two stores, so perhaps they’re just migrating the stuff to the other one? I really can’t imagine them giving up on the Nikons, Hasselblads etc. Somebody still has to be buying and selling them. Try the Ginza branch of Lemon too – it’s on the opposite side of the road from Yurakucho station. S. Definitely S. My big, big bad. I know we have the legacy lens logging system in the higher up Nikon bodies, so it’s not really an issue… But how great would it be if Nikon started releasing the best hits of Ai and Ai-S in 21st century Ai-P guise. Or offered to CPU up our old MF Nikkors? We’ve talked about money-making a bit the last few threads — and this’d be nigh on impossible to see as being a money maker — but it’d be brilliant service and add to the overall lustre of the Nikon brand. Probably end up in sales elsewhere. In operation, especially of a MF lens, I prefer the aperture ring to be honest, but yeah, I do find myself thinking would be nice to have the aperture (of an old Ai lens I’ve chosen to use that day) on the front dial sometimes… and recalling my time with the D60 [which my wife still has and I had a play with at the weekend, and is still an AWESOME little camera to me], be nice to have EXIF data and metering for all the lesser mortals on anything less than a D7100, D4, etc., etc. As I say though, I can’t imagine many takers for this bandwagon at the Nikon sales dept. I’m a total aesthetic nazi when it comes to things like this: it’d HAVE to be an official Nikon conversion, by Nikon. Anything else would just gnaw away at me. It feels impure, somehow. You’d impose a tax on digital cameras and put incentives in place for people to re-adopt medium format film? Make Nikon put aperture rings on lenses again? Make Cosina make an R-D2? School photos would be wet-plate, mandatory. Just slap Sony senseless until they started being awesome again. Faint audio soundtracks where you can barely hear the dialog on films would be made a capital offence. You should get him to explain the Lunar too, while he’s up there. Tax incentives for starting quality film labs. The Nikon D700 won’t allow live view with use of the lens’ aperture ring if the lens is chipped. Drives me crazy that Nikon won’t fix its firmware blunders and don’t know if this Nikon incompetence is replicated in the D800 or other cameras. custom function f9 – select Aperture Ring. Or use an AI or AI-S lens like God intended….. Thank you. Couldn’t check since I no longer have a D700. That actually makes sense. You might have to use it in manual exposure mode because the camera will stop down the lens to produce a workable viewing image. It can’t control shutter since that’s open, leaving aperture and ISO as the only two variables. Sorry, don’t understand. The D700 actually can control the shutter speed because that’s the time the shutter will later be open for exposure, which is unrelated to live view. The D700 does not make an exposure while in live view; it exits live view, makes the exposure, and resumes live view. When you expose in live view on a D700 it terminates live view, flips the mirror down then flips the mirror up, makes an exposure, then resumes live view. It is only the combination of a “CPU” chipped lens plus function f9 set to use the lens’ aperture ring that prevents use of live view. (That limitation seems ridiculous to me.) I’m sure of this because if you simply break the electrical connection of the D700 to the lens by unlocking and rotating the chipped lens slightly, live view starts working with f9 set to use the lens’ aperture ring. The shutter has to be open when you’re in live view. Something has to control the amount of light hitting the sensor, otherwise it’d overload and blow to white: it’s either the aperture or the sensor gain (ISO) – for live view mode. By unlocking the lens and breaking the electrical contact, you’re just telling it you’re using a 100% mechanical lens, and you’ll find that once you get outside a given exposure range (limited by the sensor’s range of ISOs) then you’ll get pure under/overexposure in your LV image. This range is much larger if the camera can also control the aperture. I hate to disagree with you on this, but this is one of the reasons that pro bodies allow a lens database to be input. I have all ten slots entered on my D3, which should give you an indication of how many manual focus Nikkors I like to use. A few people have done chips, while some others have simply pulled apart D series lenses to remount the chip and contacts to older lenses. Older D series sometimes failed in the AF gearing, or just wore out, making chips and contacts available. The older AI and AI-S lenses were very well made and have a solid focus feel completely lacking in newer lenses. However, the focus screens are just not suited for manual focus. It’s tempting to alter an F6 screen slightly to fit into my D3. Morning Gordon. Re: the focusing screen: our gracious host did just that with his D700, I think. F6 screen, cut and shimmed himself, and put it in the D700 => get your money’s worth from those ZF.2s, etc. 1) Why can’t Nikon include it on entry level interchangeable lens DSLRs, like the D60 (or whatever model it is now)? I only got into Ai Nikkors because I couldn’t afford the AF-S line, new or used. It makes sense that many photographers on a budget, students and so on, will be the same: this would be a feature that would win sales. And I doubt punters for higher up bodies were ever torn over D60s, etc., so spreading the functionality down the line isn’t going to lose sales, either. 2) I have the 24mm f/2.8 Ai-S on my D3 today… mine’s a very clean 2000s vintage serial number, I got it used for 31,000 JPY odd (lucky price). Nikon still make this lens and their listed retail price new is 68,250 JPY inc. sales tax. The big chains will do better than that, but still in the ball park. For a CPU in a similar focal length, you’d have to go to the Cosina Voigtlander line; for CPU and slightly better optics, onto the Zeiss ZF.2 line… and we’re already talking double. Ditto the used prices. I guess I’m thinking about something from Nikon slightly below, or at, the price and feature set that CV pitch with their f-mount, manual focus stuff, but with the Nikon badge and the Nikon optical formulas we all know and (mostly) love. It wouldn’t make them any money: so I’d just do it as a limited run, that once sold out would become minor collector’s items but thoroughly useful pieces of kit. Also: MF Nikkors with half stops would be nice. Just to have! 1) So you have to pay more to go up the food chain. Duh! 3) Full stops are fine since both film and digital latitude are mostly quite forgiving. Half stops for slide. But this is the short sightedness of sales dept’s I think. As a matter of fact, I did it exactly the way they planned for me. Got frustrated with the basic model, pushed out the boat and went up the line. This is where their train of thought ends. It doesn’t for me. Of course I’m not leaving Nikon, or anything [as I say, these relationships are more like dealer and junkie than service provider/vendor and customer]. But these types of things are straws added to a camels back; and when it’s time to get new equipment, thoughts go elsewhere, not to Nikon. It’s this global picture that many salesmen miss, I think. As for going down in resolution: don’t discount acuity and pixel purity in the equation. 12-16 isn’t that much of a linear difference in the end. But there is a generation of sensor development in there too, which skews things somewhat. I was surprised that shot side by side, the 2012 OM-D isn’t far off the 2007 D700 – and in some ways – like resolution and acuity – is better. Who’d have thought? Off to Shinjuku in 20 minutes Ming! I think your question (to yourself) should be: how large do I print images? When you need more pixels, and upsizing is not pleasing to you, then you go for a higher pixel density. Most modern cameras are far better at rendering details than our eyes. A D3 can provide incredibly clean images, though I can understand a desire to carry around something more compact and smaller. In an ideal situation, Nikon would make an FM or FE body with D4 chip inside, but then again the Fuji X line seems to address that as a low volume niche. I have a feeling they don’t like it because the entire experience now is designed precisely that way so they are forced to buy AF lenses; the viewfinders are small, the focusing screens are crappy, and there’s no metering. We had solutions for all of these things 40 years ago! I know I print 5ft wide and larger, as do my clients, so I need all the pixels I can get…all of the good pixels, that is. And this puts some serious demands on glass, too. Funny how some cameras have gone backwards. My F4 is quite an amazing bit of complexity, yet you can tell where the settings are without turning it on. The viewfinder is vastly better than my D3. I would probably be happy with F4 dials and knobs with a D4 chip. I don’t like the two card formats on the D4 and think it was a bad move. I’m not very fond of command dials either, though I suppose they make it easier for the engineers. A Contax 645 with digital back seems much more comfortable to operate. I like the F6 though it seems to be an evolution of the F100. The focus screen options on the F5 and F4 are much more workable, though I understand the change, because few photographers bought the other finders. Amateurs in general confuse ‘need’ and ‘want’. I’m happy with less for personal work because it lowers my storage and processing overhead, though I sometimes go bigger anyway because you never know when you might get something print-worthy. 645 is hitting 80MP handily, so we’re very nearly there. At that size you’re asking silly things of lenses and shot discipline, though. I can already see the difference between my Manfrotto 410 geared head and the Arca Cube with the D800E and CFV-39…I can’t imagine how demanding the 80MP backs must be. Command dials are useful for navigating the digital side of things and dealing with the extra settings like WB and ISO. Everybody says great things about the Contax 645, though they’re now expensive and lacking in support. Too bad, I guess. As for the F6 – an evolution of the F100 it may be, but build quality is definitely F4/F5 level. Our modern digitals are at beast F100 level, even the D4. A shame. The shake data I use comes from the LensRentals chart at count=100 (about 0.03 radians/second). You can substitute other values to see how that changes things. The upshot is that for a typical handheld shot on a D800, you need faster than 1/(6x focal length) shutter speed to get per-pixel sharpness. Have fun! PS: it’s set to read-only, but you can comment on it, and I believe you can download it in various formats to mess around with it. A friend and I were discussing this more, and I fixed a bug (minor, doesn’t change the numbers much: don’t use the rounding function in D14-22), and made it easier to try out sensors of different physical size. And I just thought of your comment above about seeing the effect of the A-S Cube on the D800. Entering numbers for the Sony NEX-5N, Canon EOS 40D, and the iPhone 4, I get respectively 6x, 5x, and an insane 17x for the iPhone (1.75um sensels!). On the one hand this seems difficult to believe, because the numbers are so high, but then it seems that the numbers should be even higher because the spreadsheet selects only 1 shaking mode from the chart whereas a real world person’s camera shake would be a vector sum of all of the shaking modes weighted by their probability distribution, which should make the rotational acceleration higher. And the spreadsheet also assumes that one needs a 1-pixel shift to affect sharpness, whereas it’s conceivable that a fractional pixel shift could affect sharpness as well. D700 is around 3-4x, which may imply that a casual user can exploit more of its pixel sharpness than cameras with finer sensor pitches, and that may be one reason why its image quality is so robust even today. Pulling in your Cube comment, I wonder if we’re all losing more to camera shake than we realize, but it’s just been noticed on the D800 first because that camera makes everyone examine its picture quality the closest due to its promise of high resolution, and the tendency to use the best lenses on it. I think we’ve made WordPress wet its pants again fellas—I have no idea where this reply will end up… But it was just a quip aimed Andre’s way: underwater shoots and the same lighting as Cameron for TITANIC => DO TELL! Fingers crossed for the print. I’m sure it’ll be awesome! Don’t know where this will go Andre, but I hope you catch it! No, thank you for that story. And Howard Schatz was a new one on me [this is how little I know]. You got some nice images commissioned there: a job well done. I liked March the best. I’d hope you can add a photograph to a calendar if the chance comes up again: a self-processed B&W from the Hasselblad? Nothing to it but to do it. Now, Andre, you probably get asked this all the time — but as a film nut I can’t resist asking — what did you think of Aranofsky’s BLACK SWAN? The opening sequence [Portman dancing] was just glorious, in my opinion, and whatever anyone thinks of the film that followed, the man hours and creative sweat that must have gone into those opening minutes and images were palpable. We sold three shirts because of that. A blog snap made for nothing! Tom, I’m trying some HTML hackery here (pasted your comment number into a reply link for another reply), so we’ll see where this one ends up! Thanks for the compliments (imitation is the sincerest form of it, I hear :)). If you’d like to discuss this more, please feel free to send me email (andrey (at) silcom (dot) com) since I’m not sure how many other people are interested in this, and I don’t want to test Ming’s forbearance. About Black Swan, I think Portman deserved the Oscar, but the movie was really off-putting to a dance lover. Not that I expected it to be a dance documentary or a love letter to ballet, but its undercurrent of hostility towards the art of ballet as well as some of the things said by both Aronofsky and Portman before release (eg. Charlie Rose interview) and after (the PR hype to cover up how much of the dancing she actually did) really turned me off, especially knowing how much the ballet world opened up to them and helped them with the movie. I agree that the opening sequence was spectacular but it made promises the movie did not deliver. I was hoping it would take the Swan Lake story and twist it in a modern way with visuals that you can only find in a movie. Instead I think it lost its way somewhere in the end. February was a challenge, but it’s also one that I’m happy with. I gave the dancers and photographer some vague direction, and they gave me this picture (and a few others) a few days later. Note to self: don’t give vague directions! I didn’t know what to do with it as every way I used it ended up looking like a lingerie ad, which just wouldn’t do. So finally I decided to cut it up into pieces to make the body parts more abstract, and then designed the rest of the poster around the fragmented theme. You can probably tell I’m a big fan of midcentury Swiss design. I must have watched Helvetica (the documentary) at least a half dozen times. For some of my visual references, I like what the Dutch National Ballet does for their marketing campaigns. Google for “dutch national ballet posters” and look at the images that show up: the hand grabbing the ankle for season 2011-12, and the theme & variations posters are two of my favorites. Oh yeah, and the print came back. I am gobsmacked and happy, and I will heed Ming’s advice to not get a printer, because I don’t really have many pictures I’d want to print right now. The darnedest thing is that stuff that renders as abstract noise on my calibrated IPS LCD panel at 100% view shows up as real-life texture in the print. The picture has a stone sculpture which I thought I had blown out in my exposure, except there was some grey noise on it. In the print, it turned out that the noise was the surface texture of the stone! I had totally forgotten about it until I saw it again in the print. There is also a 3D quality to the print that I don’t get off my monitor. Anyway, I just added you as a contact on Flickr, and if you look in my recent pictures for something called “deyoung-family-1500” with a family set against a triangular corner of some monumental-looking architecture, you’ll see a small and somewhat aggressively post-processed (I toned it down for the print) version of what I had printed. That was done with the Texas Leica. The cat was taken with a Hasselblad, but it’s a bit out of focus. Andre, I couldn’t resist topping up the comments to a hundred, causing more mischief and replying to your reply => Great stuff. Thanks for the Flickr and I’ve logged your email in the book. Listen, I got completely the wrong end of the stick and thought you’d only organized those photos; when it’s the case that you’re the author of them!? What you and the guys, of course MT, are able to do is quite astonishing. Rather than a deflating feeling (to know just how much work is ahead) it’s really encouraging to me: if you work at it, images on a level like that are possible. So listen, against my waffley nature, I’ll try to brief –> Mmm, on BLACK SWAN… I can see things that way completely. I don’t think Aronofsky has ever been a people person and it shows through in all of his films. I make a point of watching his work, but that’s not congruous with being a follower or fan. I am a film fan, hopelessly smitten, and will watch them over and over, and then again. I watch with commentary tracks, I watch theatrical cuts, director’s cuts, extended cuts, any cut. But BLACK SWAN I’ve only watched once. I didn’t dislike it, but the work’s main weakness is its narrative (a rare complaint for me to make as I dislike the way Literature theory is unthinkingly applied to Film as though it were some sort of default; Film is primarily a visual medium, it should be judged firstly, on this)—but as you say, it doesn’t hold us in its grip or cash the cheques that that opening sequence wrote so convincingly. No one’s perfect though. I do plan to revisit BLACK SWAN. Though, I think non-Ballet stuff probably has the bigger influence on your appreciation of the art. I do find this is why I know so few photographers: I honestly don’t have *that* much of an interest in them or their pictures, or care to (actively) know—though just to be very slippy here: I do have serious respect for these art makers. A film, a novel, a face my wife did, or a nondescript scene I walked past: these things have a much bigger influence on what I get into my head about photography. I’m sure we’re all the same. Even the guys who get to publish snazzy photo books, etc. I know a few professional image makers and have met (and worked with/for) tons and tons. There are all sorts, but the more “arty” they get, the less they care for other image makers. Usually. Not in a proactive, spiteful way; though there is a whiff of that. It’s more like they are totally preoccupied with themselves and what they want do. Couldn’t care less about another’s images or ideas. “So what?” is how I’d sum up those guys’ reaction to other work in the same field. MT wrote an article on print a few weeks back that seemed to suggest a lot more is possible in print than screen. As your finding there does too. Yet the first article I ever read on this was a Luminous Lanscape one (and that guy has a fair old bit of experience printing) where he wrote that prints have less dynamic range and less gamut than cameras. And this article looked like it was late 90s to early 2000s. The gap can only have widened since then? The main problem is that I’ve never printed and haven’t done the best thing—see for myself. I just haven’t spent any time learning the basics of the subtractive CMYK space. Though I’m an idiot because I work in an office full of graphic designers, full time professionals and seasoned veterans of printing, paper, halftone, CMYK –> the lot. Ming, like Taleb’s Black Swan, the Black Swan character in the ballet isn’t someone you want to meet either: she’s all bad news and leads our hero to his tragic end … except for when the Soviets ran Russia: they told their ballet companies to make a happy ending, for the good of the populace. Tom, ballet movie guilty pleasure: Center Stage. That is our little world’s favorite B-movie, and it is so awful, it’s good. I think normal people would just think it’s an awful movie. To clarify, I art directed some of the pictures I commissioned — the photographers are all listed on those links I posted earlier, and I definitely do not want to take credit for other people’s work! I basically made sure the poses were good ballet poses: a photographer unfamiliar with the art form may not know what looks right, and what looks wrong. I’ve seen too many dance photos which memorialized some basic technical (dance) mistake or a less than flattering angle for the dancer. So no reason to be too impressed with my image making capabilities. I would say we’re more in the same boat than not. Every time I add a contact (and that includes yours) or look at the Flickr pool for Ming’s blog, I always feel inadequate. The tones on your F2 B&W, especially the one with the window reflections, look really nice. Was that developed and scanned by your local lab? I think good artists are always interested by things outside their field. At some point, they need to be able to say something interesting about the world, and the world is usually much bigger than any particular artistic niche. Prints are tricky to quantify. No doubt they have technical limitations, but as they say, if the subjective impression is contrary to the objective measurements, then maybe we’re measuring the wrong things. I reread Ming’s print article again, and I think the comment about paper being reflective rather than being transmissive like a screen has a lot to do with the differences between the two media. For example, an LCD screen has an awful time displaying black. Just look at a calibrated CRT or a good plasma display (the last generation of Pioneer’s Elite Kuro plasma display has yet to be surpassed in this regard), and LCD looks pretty bad. A print on the other gets to use ink on paper, which has had perhaps a century of work put into it to look good, and doesn’t have technology fighting it. Why would I yell at all? Philosophical discussion and tangents are encouraged. Art – of which photography is a type – grows through experimentation and the diffusion of ideas from other disciplines. Were you referring to my F2 B&W images? I process and scan all film myself now. I think printing is actually an even better selection/ editing test than just culling on a monitor: you’ve got both limited space and limited funds, so the images you choose to print have to pass a much higher bar. Funny thing is frequently what we print is also influenced by what we think will print well…which isn’t always the same as the images we like emotionally. But back to the monochromes, it certainly wasn’t much to do with me –> I have great equipment = an F2, Ai Nikkor primes, top notch film, and this is the key one: a Sekonic light meter. I suppose the other possibility is that I took the film to one of the better stores in the CnK network. I’d used one in my local supermarket for all previous film: it was developed and scanned by university students on their part time job, who didn’t put their back into it, let’s just say; this one went to a CnK in Shinjuku, near all the camera shops, so at least you get an adult who, perhaps just by dent of location, puts a bit of effort into it. I think the developing they did for me shows that. All the more interesting, because I had used them, that location, just once before on a roll of print film [color negative] and they were about as bad as the students at the supermarket were… Luck of the draw I suppose. But Andre, full credit is not really due because I’m supremely confident I couldn’t do those exposures again. Honestly. I was looking back over the set, racking my brain trying to remember each exposure. I definitely did things like take spot and incident readings… have a think about what I thought’d work OK for my exposure, etc. But I’d never used this film before and was winging it, really. I just kept it in my head that Ming thought there was plenty of highlight room in Acros, so I’d intended to overexpose, just a bit, a stop at most but more like 0.7 EV, I’d put something a bit darker than I thought the midtone [the actual midtone] of the scene was, I put that slightly darker tone in the Sekonic spot and had a looksee what it gave me. I have been using this meter, though, blissfully unaware that it was giving me f-stop readings between full stops, but not numerically –> on a weird lcd “dial” graphic next to the aperture numeral in the readout. So, not knowing that, I was just looking at the digital readout for f-stop [in aperture priority metering mode] and going with that. All these keepers were probably just the flukes to end all flukes; combined with a developer who knew what he was doing and kindly did it for me. Color is still it for me though—even looking for the luminance ramps and good light that make B&Ws work, and finding them, it’s seems to me, it feels to me, that color tones obviously ramp in the same way [they’re in the same light] so there’s nothing, for me, that works in B&W that wouldn’t work better in full color. Half of that is an aesthetic decision, just as its converse [B&W only] is. I think when you grew up has a huge bearing on this. Actually it’s entirely an aesthetic decision – what works in B&W works in color, but not necessarily vice versa. In that sense, color may well be the more flexible medium. 4) CENTER STAGE goes on the list! I was actually referring to Tom’s B&W, but yours aren’t bad either, Ming. 😉 I guess what I like about them is that they evoke a certain mood. I like the rusty fence with the green cabinet, and the narrow subway hallway B&W, too. They’re not pretty in the conventional sense, but there is a kind of a sense of the place that comes through. Perhaps because they’re abstract, I am more likely to impose my own thoughts on them. Maybe if I look at them tomorrow in a different mindset, I might feel differently. How you use perspective to frame the subject is also interesting: mine always ends up feeling like I’m a peeping Tom! (And that’s “Tom” in the generic sense. :)) Anyway, take my feedback as a viewer however you like, but that’s what they stir in my mind if that helps your path forward. Tom, my view of my Flickr photostream is much messier than the public’s view: I’ve been trying to be good about editing things. Hidden away are things like all of my contact sheets so I can pull them up anywhere I might be, but no one else would be interested in seeing them. Selecting for prints definitely sets the bar much, much higher. You might worry a bit with film at around $1/frame, but when it’s $45 per print (12×18 in my area), then you have to think really hard. Sometimes I think the make-a-print exercise is just an economically-incentivized way to make people think more carefully about their photos, and the print is like a little reward for doing that. What is making me reconsider getting a printer again is that I now have so many questions about how things will print. I’ve been scanning my latest 6×6 with just a 1×2 pano resulting in about 25 Mpixels, as well as some 135 frames as a single shot (holy cow, those things are grainy and low-res compared to MF), and I wonder how well they’ll print. Is it worth the effort to do a higher-res scan? As well, how my exposure and PP choices will affect my prints, and having a printer would let me close the feedback loop much faster, assuming I can get my print workflow consistent. About differences between print and screen, I’ve been reading Jeff Schewe’s newest book on printing, and he makes an interesting point that displays are typically around 100 DPI, whereas a print is anywhere from 300-360 DPI. With a screen, you can only view at 1/9 the area of the print or have 9x fewer details at the same viewing distance as a print. So while you can zoom in, you can’t ever literally see the whole picture with a screen with the same kind of resolution as a print. Haha, not at all. The only reason why I got confused is because there’s a window reflection shot with the F2 in that camera’s shooting with the classics post…my bad. Try printing on fine art baryta – you’ll find the bar gets even higher, but the results are immensely rewarding. Is scanning higher res worthwhile? You get more grain info, but no more real detail. I honestly can’t see much of a difference in print between a 12MP ‘scan’ and a 36MP one; I wouldn’t push 135 frames much beyond 13×19″ anyway – the results from digital or MF are much, much better. A sad story related to wanting a D800 … I showed someone Ming’s Oculus print a couple of days ago. Knowing he was a Nikon fan who wants a D600, I mentioned that it was shot with a D600, and the very first question he asked was, “Why didn’t he use a D800?” My tongue was firmly bitten partly out of politeness, and mostly because there really isn’t any answer you can give that would be meaningful to a person like that. Because at that print size, I could have used a D700; you need to go beyond about 30″ to see the advantage of the D800E. Also because the D800E was set up for something else at the time…better the camera you have with you than one you don’t – and it’s not exactly as though the D600 is a really great compromise in image quality! But you’re right: there will be people who always see equipment first and images as a byproduct of the process, not the underlying reason for it all. I’ve abused a few D700 pixels for print in my day … designing a calendar and some marketing material for our local ballet company. Many of the shots were done backstage in dim lighting and often needed to be cropped (horrors!) to accommodate some text. Those are pretty damned tough pixels that can take a lot of abuse, but the output print format, though somewhat large, was fortunately not terribly demanding. I think there was really only one picture, due to excessive cropping, where I wished I had more resolution, but the rest was fine. When a shot was setup right, with good lighting and composition and framing for the added text later, D700 was gorgeous, as was a mark 1 Canon 5D (shot underwater with the same lighting setup Cameron used on Titanic!) whose output I got to see on a 36×24 high quality print. Tom, I’ll let you know in a couple of days when the print comes back. It’s being done on an Epson 9900 on Hahnemuhle matte paper of one of my 6×9 negatives from the Fuji GSW690III stitched together with a DSLR scan in a 12×18 size. I’m just hoping it won’t be too embarrassing. I have to say though that I feel lucky having 2 pro labs near me that offer the whole gamut of photo services. I’m trying to figure out if I want to take the plunge and get my own printer and inks, or whether my local lab is more economical in the long run. Tom, no idea where this will show up either! A few years ago, I was on the board of directors of our local ballet company, and in an American non-profit arts organization, board members are expected to give some combination of time, money, as well as help raise more money. I was responsible for producing our smaller, in-studio performances that let the dancers do more experimental work that may be too risky for a big, expensive theater. It also let them create their own work instead learning someone else’s, which is what they normally do for most of their careers. The cover, February, March, and September were pictures I commissioned, and I served as art director for March and September. You can probably guess September is the underwater picture. Every picture was taken with a D700 except for February and September, both of which were taken with a Canon 5D mark 1. I really liked Howard Schatz’s underwater work, and wanted to do something like it, and fortunately, we had a photographer in town who specialized in that kind of thing. I wanted a black background, so we had to shoot at night, which means lights. The photographer went to nearby LA to rent the lights, and it turned out that they were the same lights that Cameron had used for the Titanic. The rental place was especially excited because no one had used those lights since Cameron returned them! So that’s my story. Thanks for listening! P.S. I might have to eat my words as I look through the gallery again, I can tell which ones were cropped and which weren’t. Even at reduced web resolution, it’s not hard to see what was done. …if people just kept using old lenses, then who would buy new lenses? I work around sales guys and I’m 110% sure this is the rationale. And it’s what will kill their business for them if they don’t put it in check [impossible to stop completely]. Your line written in jest betrays something about the mindset of business and just how passive consumers have become. You write a lot about business/money so you’ll know better than me Gordon, but business is about servicing a need. Or creating one, and then servicing it. But either way: servicing a need. Need and service. Hold that thought. The line above is a mutation of the “create a need…” model. Business now creates the illusion of a need, and services that instead. It only works if consumers play along. We do, and it seems quite acute in cameras. We get answers to problems camera companies think we have or tell us we have; our actual problems get swept under the rug. Just look how much comment for focusing screens there is on here. No, we’re not going to set the bottom line on fire if Nikon or Canon or whoever gave us what we want [and as you point out, there is the historical evidence that we wouldn’t]; but just going back to first principles—isn’t that what they’re supposed to do? Isn’t that what the men who founded these great companies had in mind: to do something, not pretend to; to make some money from the product of this enterprise. Most of all, to try and give us, customers, what we want. On the prints, I’m really embarrassed Gordon… I still haven’t physically printed a single one of my images yet. No, truly, that embarrasses me; I know I’m a kind of fraud for it. So I should just pick an image or two and go for it. But every time I try to sit and do that, I can’t find an image or two I want to commit to. No that’s not right: can’t find an image or two I’m motivated enough to want to print. I guess photos are still very transient, not-so-important things to me and I experience heavy dissonance when confronted with the idea of preserving one [of my own] for a long time in print. The funny thing is, I actively seek out imagery [paintings, photos, etc] for my living space and couldn’t live without things like this on my wall. I’m still quietly looking for a frame I’m happy with for MT’s Verticality. I’d love an MT tree someday. And after that perhaps a private offering [not a commission, just a handpicked image from his stock] decided upon between MT and me, for my kitchen, for me and my family to live around. I have a panorama photo from Dungeness, Kent of the fisherman’s village with the nuclear power plant, Dungeness B, where I worked for two and a bit happy years, on its way to me; I have paintings [cheap prints of]; and my walls are PLASTERED with disposable camera prints and convenience store photo prints onto regular paper, of my kids, etc. My wife, bless her, took and did all them; they’re probably the best things we have. I certainly look at them the most, get lost in trains of thought, the most, when doing so. I only print to screen, and with the largest [within reason] computer panels out there being not much bigger than 2500px across, well, who needs a D800E [but on other parameters, yes you could still argue more pixels is better: forget resolution, the color information a D800E gets you will be way in advance of my 3000px by 2000px Epson R-D1s, for example, certainly my D3, too… and there’s binning, a D800E binned down to Epson R-D1s resolution does not give the same picture, and I don’t mean the optical properties that the lens mount, etc., give to the image]. In a way, printing to screen is much more severe thing as it opens up the possibility for pixel peeping. Yeah, you could get a loupe out on a real print, but who does that [normal viewers, I mean]; whereas, when I first started photos and would open up a picture in iPhoto, first button even I went for was the 100% zoom. I think this is the default response for most computer users, confronted with an image presenting itself as an image made for imaging’s sake. With a print I’m sure the viewer would apply a similarly critical eye—just they’d look at things like composition or color scheme maybe, not how big or small the print dots are. (1) is circa 40,000 JPY so it’ll take me a couple of months to get there [all things being equal]. (2) is actually not too bad for Zeiss, but still about 90,000 JPY new and 70,000 JPY used [a clean one], so at the very very quickest I’m looking at early next year and skipping Crimbo presents — when anyone asks me about a Christmas present, a contribution to the Zeiss fund will be the answer — hopefully I can make it. But in terms of priorities, lenses are down the big list now. Computer and software are higher up. And computer and software are still luxury items. Before that there might be — no, there will be — things my wife wants/needs, likewise the kids! It’s better that I’m last on the list, because, Jesus, if I were any higher up the house’d be wall to wall cameras and equipment [if it isn’t going that way already]. But I think of the wife and kids. Yes I do. Because the new ones would be better – unfortunately this means the companies would actually have to make them better…and that requires investment and work! Verticality will work with a plain black mid-weight frame, perhaps 1″ square on each side. A moderate matte size of 3-4″ – though it doesn’t even really need one because there’s a bit extra on the paper for precisely that purpose. I might throw some trees into the next print run, but I think they’ll more likely be a selection from Europe post-October, then one again from Japan in the run up to Christmas. I’m planning these around when I have the time to actually put myself into the art-mindset, challenge some of my own preconceptions of what an image or scene should be, and simply shoot creatively. The best images make you think, feel, remember, get immersed – preferably all of those. Remember, drawing style of the sensor size matters, too. The way a normal FOV renders on my OM-D or compact is very different to my Hasselblad – even at small sizes. You’ll see that soon enough with Charles Bronson anyway. The 105/2.5 is nice and cheap for a user. Oddly enough I’ve never used one either; I preferred the 105/1.8 (insert devil horns here). 2) The 50/1.4 ASPH is actually much more practical and affordable than the 50/2 AA. My personal pick. 3) The C/Y 2/28 Hollywood distagon has the same optical formula as the ZF.2 2/28 Distagon, which is actually available in a native Nikon mount with chipping. I have one, and it’s awesome. 4) Add the forthcoming 1.4/55 Distagon and the current 2/100 Makro-Planar to that list, too. And the 2.8/21 Distagon if you like wide. The 28G and 55/2.8 AI (make sure you get the 1:1) are excellent choices. I wouldn’t bother with the 60/2.8 G unless you’re going to actually shoot macro with it, or close range product. The 55/2.8 won’t drift between frames because it’s manual focus. How’s the Bronica working out for you? Nikon and Canon are running into a saturation problem, in that many in the market have already bought a camera. It’s getting more like automobiles and less like mobile phones in the buying cycles. The early marketing efforts emphasized megapixels and spoke of film-like or better-then-film qualities. Really it was convenience that won out for the average consumer. In order to have a quantifiable number, many consumers looked at megapixels, then they looked at price. I suppose that new Nokia Lumia with a 41 MP sensor and Zeiss optics really confuses some consumers. Of course on a professional level the approach is different, in that output and speed of delivery guide purchases. Most pro DSLRs are still geared towards sports photographers and photojournalists. The rest of us professionals have to deal with perceptions, almost like performance art on location. If we bring a big camera the client does not use, then some will find that sufficient. I think this is one reason medium format dominated in the past, even when large printing needs were not the output consideration. We see a little of that now with some professionals moving in medium format digital, but then usually only printing magazine spread sizes. Honestly, my large format kit is complete overkill on printing output potential, though there are advantages to the movements. Anyway, we can think of 1 series Canon and single number Nikon as flagship products, sold in low volume, but intended to make an impression; they are quite good and capable, well built, and customizable. Okay Tom, tempting you a bit more on that 105mm f2.5 with that link. It is not an expensive lens, because it is not rare. Looking at the technical data it may not seem to be anything special. Take photos of people with that lens, and it suddenly becomes obvious why someone would own one. I was once asked if I had to get rid of everything Nikon I own, but could keep one camera and lens, which would it be? That camera is a Nikon FE (or FE2, FM3) and the lens is the Nikon 105mm f2.5. Probably seems an odd choice, especially with shooting wide to normal most of the time, but the 105mm is pleasing to me to use. So I know a bit about being on the other side of the camera. We all act. That’s all there is. Even when the camera isn’t there. I eventually came to feel that to make a good picture with a cameraman you just need to throw a switch inside your head/heart. I am, or was, quite shy and retiring in real life, but in front of the camera — with someone paying me — I found I was able to turn it on. Then turn it off again, at will. I think the best actors do this to a much, much more dextrous and skillful extent. I always imagined modeling to be a very base, one note and cliche, form of acting. But back to what I mentioned above: people want their picture [portrait] taken, we do, really. It’s akin to being loved. We want that. And the proof is that when it’s time to have a picture taken, we don’t want our picture taken. Because we don’t reject it in a genuine way; it’s done in a kind of faux oh this is such a chore kind of way, grade E acting at it’s worst. We all know what I’m talking about. I was a bit like that when I started doing the modeling; and nearly all models are. Some just remain that way, and hence all the nonchalant pouting and pretentiously sour faces in fashion photography. But I got past it and to the point of honesty. I’m human, an ego maniac. Though I disagree with Descartes with Protagoras — both icons of metaphysical narcism/sollipsism — I think the spirit of their thoughts is important and revealing. And I’m as deep in it, if not deeper, than they were. I know that. I want my portrait taken, I do think I’m special and important and it’s right that someone wants to take a picture of me; at the same time it’s all fluff [copyright Iskabibble] just dust in the wind, so sod it—go at it, have fun, don’t have fun, recognize your huge ego and then you can forget it. Not the lighting, not the cameraman, not the client, not the make up, you have full creative control of what you look like when in front of the camera. If you come out looking bad, well, you’re partly to blame: you could have done something about that when you were in front the camera. Tony Hopkins isn’t going to let anyone dictate to him how his Titus Andronicus will finally be, he makes that decision. Bruce Willis made John McClane and isn’t listening to anyone tell him how JmC should react to such and such… Sigourney Weaver knows who Ripley is and she calls the final shot on how that character acts and feels. I tried to do the same. Just be a character in your own story. When it’s go time, you flick the switch. Weren’t we talking about Distagons? And Nikkors! Aren’t those “1001 Nights” posts at the Nikon Imaging site great. How they managed to call that “1001 Nights” I don’t know. And how they manage to squirrel this AMAZING content away at the back end of the site, I don’t know either. It’s very tasteful stuff, so just plastering banners across the top page isn’t the way to do it, but I’m sure they could promote this a little better. It definitely results in sales. And what’s better: memory and a favorable impression of the brand. That’s latent retail action waiting to happen in my book. I really had the 60 in mind as a dedicated “scanner” lens. The working distance is so close, backlit subjects is probably what it’s best at: I’d actually thought an autofocus lens would be less prone to drifting when I’m scanning a set—I set focus once, auto; then switch to MF or lock it, to make sure that doesn’t change. No worries? Whereas with the focus ring on the Ai-S, perhaps the effect of gravity might, ever so slightly, shift its focus as the shoot continues? And there’s no locking feature possible with the older lens mounted on my modern body to guard against this. BUT, price, quality, utility all in mind—the 55 2.8 micro is the smart man’s choice. On the list it goes! That’s in Japanese, but I’m sure you’ve seen this page in English? [If you’ve ever researched the equipment a little]. It’s a real shame that they are even squaring away content that’s already made and paid for, when they could just leave it there and help us users — who are keeping these great brands quasi-alive — out a little. But yeah, the Bronica is great. To be frank, what made my mind up the most on this camera was just the “ZENZA BRONICA” font on the front of the finder. Everything else flowed from there. But, wow, what a piece of equipment. The PS and GS lenses seem great, and in the course of my research, I came across the factoid that Bronica built a whole new factory to produce these lenses and the updated bodies to mount them, which at the time was *the* most advanced facility in the World. The 6×7 format GS camera is a bit of a rarity in Western opinion and people recommend avoiding it — as finding parts and servicing is difficult — but over here there are a good few of them about, plenty of parts and at least three companies I’ve found that service them [along with other Bronica cameras]. The GS-1s are BIG cameras, not quite Mamiya RB/RZ 67 big, but getting there. But imagine, you can have a body with a lens — literally state-of-the-art only a couple of decades ago, I doubt it’s really possible to get much noticeably better optically — for only 300 USD. Not 3000; 300. Lenses in MINT condition for the GS go at about 200-400 USD each. Circa 100-200 USD if you’re not fussy about boxes, etc. Unbelievable. My experience with researching and buying the SQ was that this is not so secret anymore and the best choice, the SQ-Ai, is hard to find and the other bodies too. I had to settle for the oldest model on the roster. Glad I did! You don’t see great condition SQ series come up lightly, and when they do they go quite quickly. Lens prices are a bit more than the GS line and the more sweet picks have been found out and don’t crop up too often. But still, it’s a “slept on butter” in my opinion. Four links and a mammoth post for you Ming! All in a morning’s bullet train journey to the sticks!! That’s a mammoth post, Tom. Took me a good ten minutes just to get through it all! I don’t actually have much to add other than hipstagram is basically the ignorant and lazy way to get a poor approximation of sloppy developing errors. The real deal will always be the real deal – scanned Polaroid or otherwise (and at lead you can get the project impossible stuff over there!). I suggest the 55 simply because you are ONLY using it as a copying/ repro lens; you won’t really miss any of the other advanced features of the 60 G. I use the 60 because it makes no sense to have both; I *did* have one previously but it’s now in the possession of my brother. Incidentally, the 60 doesn’t have anywhere near that wonderful damped MF feel. Thanks for that Ming!! Interesting info. on the focusing screen; I had no idea!! I’ve been a Canon man all my life so this is a big move for me! You need to change out the focusing screen to one that is optimized for Manual Focus. The screen that comes with AF cameras is optimized for viewing not focusing. I know, and I’ve pointed out the whys of this on several occasions in previous posts. Consumer camera screens are biased far towards brightness instead of snap; the pro cameras like the F6 are better, but still not as good as the MF-only cameras. But try finding an F6 replacement screen in Kuala Lumpur…no dice. It’ll have to wait til I go to Japan in November. Does a quality “focusing screen … optimized for Manual Focus” exist for the Nikon D800? KatzEye doesn’t have one. I have not purchased a D800 only because I can’t find a suitable focusing screen to use with my manual focus lenses, and the D800 live view is reportedly so bad (plus lack of EVF and no focus peaking). Sadly no. And you can’t cut one down to fit either; the D800’s screen is the largest that’s ever been fitted to any Nikon. MF screens are too thick and will affect the focusing distance to be out of adjustment range for the mirror. Hi Ming, a little off the topic but as I saw the Nikkor lens I thought I’d ask you something. I’m thinking about buying a Leica M7 ,MP,M6 (just one,used to an M7 and traded for a 5D, dumbest thing I’ve ever done!!) or a Nikon F6. Apart from the fact that one is a rangefinder and the other an SLR, I’m enquiring about the quality of the end result. I know all the limitations of the 2 systems and I’m flexible with both but would like to know at the end of the day will the result from an F6 and a good lens be = to that of the Leica? Thanks, your blog is so professional!! It’s a cool lens. That swirly bokeh in the picnic shot reminds me of my Summitar, and the MS-Optical Sonnetar. I wonder what it is in the design that gives that ‘swirl’ shape? I’d love to shoot a roll or two with one – I’ve seen them in Hong Kong at a dealer. But the price… though it seems like you could get your money back out selling one if you owned one, unlike spending the same on some modern digital equipment. I think it’s got something to do with a) double-Gauss designs; b) the physical position of the aperture; c) possibly a side effect of coma-correction.